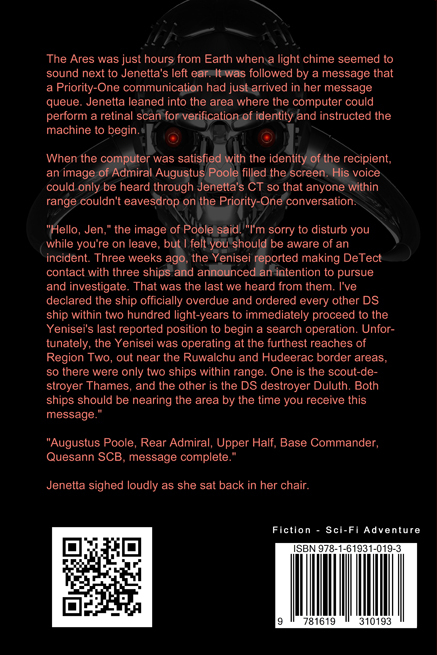 Admiral Jenetta Carver®, in Region One for just the second time since becoming Commander of the Second Fleet, receives a message that the scout-destroyer Yenisei, on routine patrol, is overdue. The ship's last report ended with a statement that they were attempting to overtake several small ships spotted on their DeTect monitors. 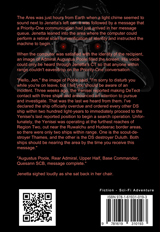 Admiral Augustus Poole, in command while Jenetta is away, has officially listed the ship as missing, and ordered all available ships within two hundred light-years to proceed to the Yenisei's last reported position and begin a search. Weeks later, the Yenisei is found. 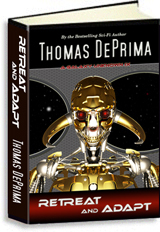 Technological advances have made Space Command the most powerful military force in the known galaxy, but although sheathed with Dakinium and believed to be almost impervious to weapons fire, the Yenisei's hull is riddled with holes and the crew is dead. The ship's computer log contains images of three attacking vessels with a configuration never before seen in GA space. It appears that a new enemy has emerged, one with weapons superior to anything Space Command has.